To Say or Not to Say? This post was adapted from How Do You Mend a Broken Heart?, an article I wrote for a local women’s publication in recognition of February 1 as National Wear Red Day. I have added some questions for you at the end. How many times, figuratively or in reality, have you held the hand of a girlfriend, sister or daughter whose heart was broken? You knew it was coming; you told her long ago this relationship was not going to be good for her. Now you put all that to the side to help her pick up the pieces and move on. You do this without thinking when your loved one has an emotionally broken heart. But do you care as much for the condition of her physical heart? You would warn her without ceasing if you feared the man in her life was going to kill her. Do you tell her that her relationship with cigarettes or unhealthy foods or her favorite chair may do the same? Heart disease is more deadly to us than all forms of cancer combined. It rips our mothers, sisters, daughters and dearest friends from our lives. None of us escapes the pain of these losses unscathed. But we can help stop it and the sooner we begin, the better. Call your favorite girls together and have what could be the most important heart-to-heart talk ever. Your agenda? “Life’s Simple 7”. Start with: eat better. Feed your physical heart what it needs. Knowing you are doing so will feed your emotional heart. Get moving. Make being active together what you do when you get together and do it often. Stop smoking. Yes, it’s hard, so help each other. Fight this battle now while you are in control. Don’t wait until you are in the back of an ambulance or in the cardiac care unit. If you will make real progress on these first three, the next four will happen so much more easily. Control your cholesterol. This means having your cholesterol checked by a medical provider, not leaving the office until you understand what the numbers mean and what else you need to do (or help your girlfriends do) to get those numbers where they need to be, and then doing those things. Manage your blood pressure (BP). If you are not already managing your BP, then your BP is managing you. Consistently high blood pressure over time is deadly; it has more than earned its reputation as the silent killer. Lose weight. Understand the many benefits of maintaining a healthy body weight and learn what that range is for you. If you are five feet eight inches tall, what would be a healthy weight range for you is not going to be the same as it is for your best friend who may be five feet, three inches tall. And this is not about what your backside or thighs look like in a bathing suit, it’s about what the inside of your arteries look like and how much effort your heart has to make to pump blood. Finally, reduce your blood sugar. How many of your loved ones or friends have diabetes or pre-diabetes? Being diagnosed as a diabetic automatically earns you the status of being a cardiac patient as well. This is not the kind of “two for the price of one” deal you want to redeem. February 1, 2013 is the 10th Annual National Wear Red Day, part of the American Heart Association’s Go Red For Women movement. 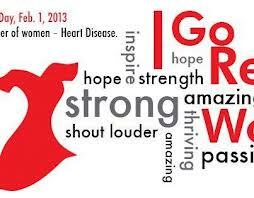 February is also observed as American Heart Month. Let these observances be a reminder of how important it is to care for your physical heart and the hearts of the girls and women you love. How do you mend a broken heart? By doing everything you can to keep that heart from breaking in the first place. Now – my question to all of you reading this, female or male: do you think we should say anything to our loved ones about their habits/behavior that puts their health in peril? How much should we say? Or should we mind our own business?